Federal Reserve Chairman Jerome Powell says the central bank has no bias in whether its next move is up or down, but his colleagues may deliver a more hawkish message. The Federal Open Market Committee is likely to forecast one interest-rate increase for this year, down from two in December’s projection, plus one more hike in 2020 — though it’s a close call, according to economists surveyed by Bloomberg. Even so, the committee will probably repeat that it will stay “patient” with future rate “adjustments” in its policy statement released at 2 p.m. on Wednesday in Washington, as well as announcing when it will end the gradual shrinking of its $4 trillion balance sheet. The rate projections in an updated dot plot, along with other economic forecasts, will be released with the committee’s statement. Powell, who in January began holding a press conference after every FOMC meeting, will start speaking to reporters 30 minutes later. For 2020, 2021 and beyond, the dots are likely to show some divergence among policy makers over the outlook. The December forecast showed rates peaking at 3.125 percent in 2020 and 2021, with a majority of officials clustered around that level. But the new dot plot may be more scattered — with some officials projecting several more hikes while others see no further moves, or even a cut. The forecasts could throw cold water on investors’ expectations that the Fed has ended rate hikes. 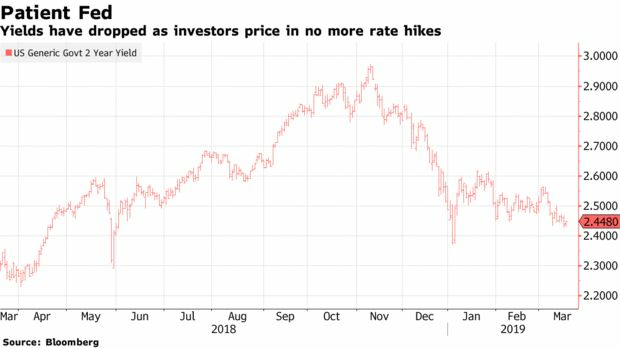 The two-year U.S. Treasury yield has dropped half a percentage point since early November as global growth slowed and central bankers grew less confident in their outlook. While the FOMC statement is likely to be similar to January’s, the description of current conditions could be lowered. The median economic growth forecast for this year is likely to be cut to 2.2 percent from 2.3 percent in December, and the unemployment rate forecast could edge higher. 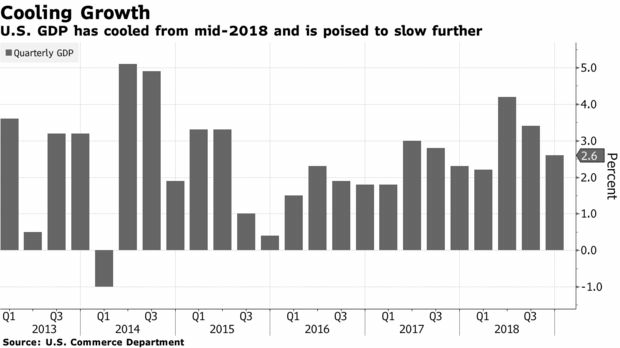 That reflects a slow start to 2019, with the Atlanta Fed’s tracking estimate of growth at less than 1 percent, as well as continuing headwinds, from a battle over trade tariffs and the delayed impact of past rate hikes. Global growth has slowed and the European Central Bank in early March slashed its forecasts while delivering a fresh round of stimulus. Economists also expect the FOMC to announce when it will halt the process of managing down the size of its balance sheet as the Treasuries and mortgage-backed securities it holds mature. 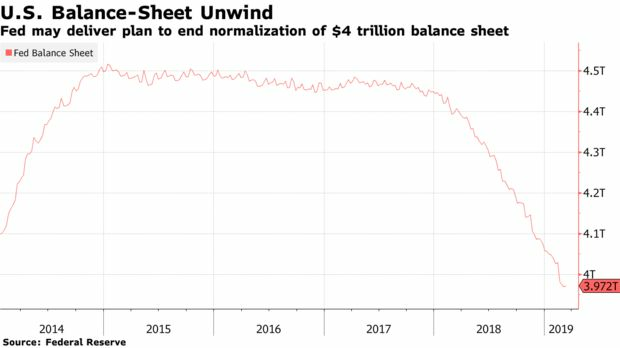 They see that end date as most likely in the fourth quarter, at which point the Fed’s balance sheet will be around $3.5 trillion compared with its post-crisis peak of $4.5 trillion. The balance-sheet announcement is likely to leave some questions unanswered, including the duration of securities the Fed will hold as well as what to do with mortgage-backed securities. The central bank has expressed interest in moving to Treasuries-only holdings over time, leaving open the possibility that it may eventually opt to sell remaining mortgage-backed securities to eliminate them from its portfolio.